Katy Le Tissier is a qualified & insured beauty therapist graduate from Chichester College of Arts, Science and Technology and technology with 15 years experience as a mobile beauty therapist on Guernsey. 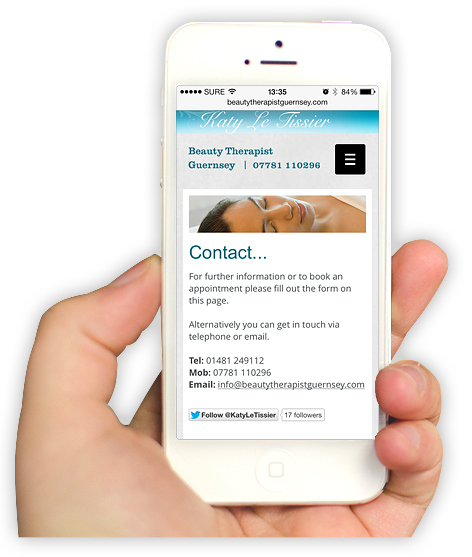 Click here to view Mobile Beauty Therapy Guernsey Website. Matt from Web Design Guernsey was helpful, professional and very efficient. The site designed was totally to my requirements and within my budget – I would highly recommend! Client Feedback: Katy Le Tissier, Mobile Beauty Therapist Guernsey. 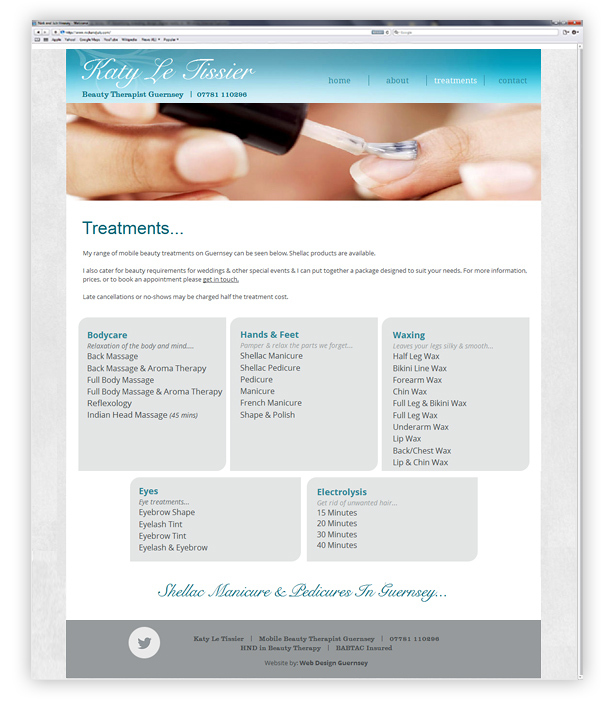 The design of the website needed to compliment the services that Katy provides; namely clean, elegant & calm. Simple, crisp photography was used to enhance this over all feel. The purpose of the website is for Katy’s clients, & potential clients, to be able to view the treatments she provides & then to get in touch & book a session. The simple structure of the site & clear calls to action allow this to be done easily. As Katy provides a mobile service it also made sense that her website was optimised for mobile devices. When viewed on a phone or other mobile device, the website is displayed in a way that makes navigating, reading & interacting with the content easy. 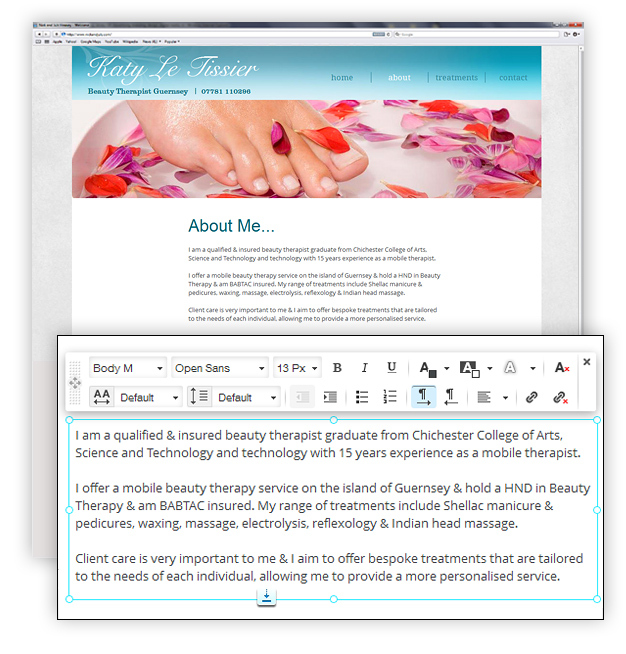 Katy wanted to be able to update her website easily & without cost when new treatments & services become available. With the content managed web solution that I provided, Katy is able to update her site whether she’s at home or on the move via a simple log-in. The user friendly CMS interface means that no web or html editing knowledge is needed to keep the site fresh & up to date. The SEO (search engine optimisation) benefits of having constantly updated content on her site means that she’ll be found easily on search engines when people type in searches for the services she provides.